Our staff welcome you with “Ikram”, the traditional Emirati hospitality. 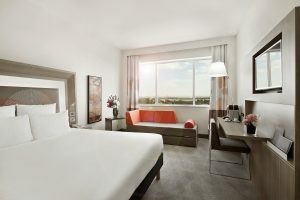 Our guestrooms and suites come with complimentary Wi-Fi, minibar, interactive flat screen TV, individually controlled air-conditioning and eco-friendly amenities. The comfortable beds and bathrooms welcome travellers after a long day of work or sightseeing. 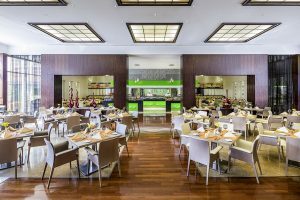 Start the morning with a continental or full English breakfast in Entre-Nous Restaurant, our all-day dining restaurant. Then relax by the pool and enjoy signature cocktails and light meals from Chills Pool Bar. End the day listening to live music at Blue Bar. Whether travelling alone, as a family or in a group, make Novotel World Trade Centre, Dubai, your place to stay. – Book direct for the best price and be part of our Accor Le Club family!